Welcome to this month’s BioNews. We must learn to free ourselves from the control that others exert over us. As we learn we become FREE, we become powerful. This pursuit of self defense in wellness, I call “The Martial Art of Wellness.” And as we practice we become Wellness Ninjas. ” I have been on the F3 for 5 months. I LOVE IT. I am a full-time fitness professional and I wake up feeling great every day of my life. In addition to taking care of my body, I used to attribute my sense of wellbeing to the pharmaceutical grade supplements I’ve been taking for 15 years. In my never-ending quest for the best possible health, I discovered Bio-Algae. The idea of eating real food (not laboratory chemicals) made good sense to me, so I decided to give it a try. 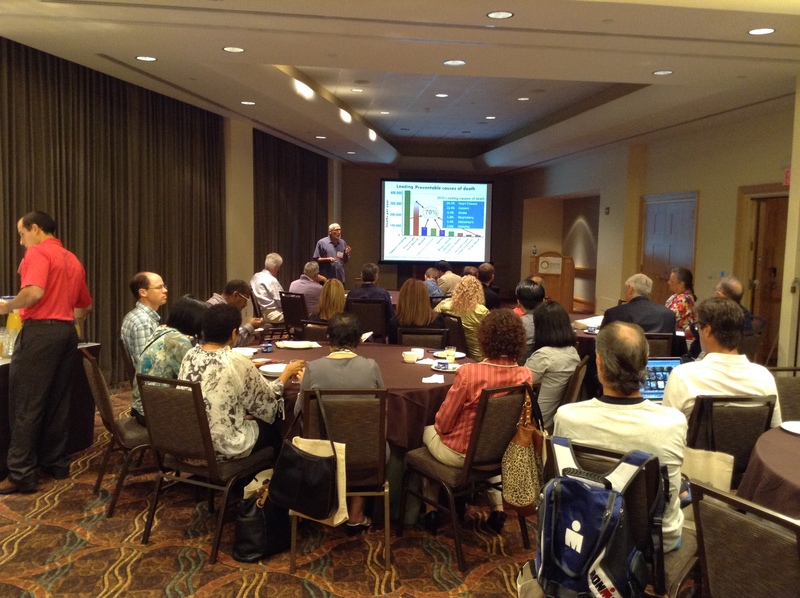 BIOAGE was a sponsor at the Integrated Healthcare Symposium in Hollywood, FL September 19-20, 2014 where “Focus on Brain Health” was the theme. I also had the opportunity to present Dr. Kiriac’s research to 60 professionals working in the field of brain health; psychiatrists, MDs, neurologists, DCs, and PhDs, a super crowd interested in working with alternative natural solutions to prevent and resolve brain diseases. In this month’s BIONEWS, I am sharing with you the charts that I presented during this morning’s conference. And to each chart I am adding approximately what I said during the talk. Since I am not constrained to 50 minutes, I may embellish or add more information here for your benefit. Note: My commentary will follow the charts. Good morning and welcome to “‘Let thy food be thy medicine’ hasn’t worked…” I will be talking about these three agenda items in a manner that you have not heard before. 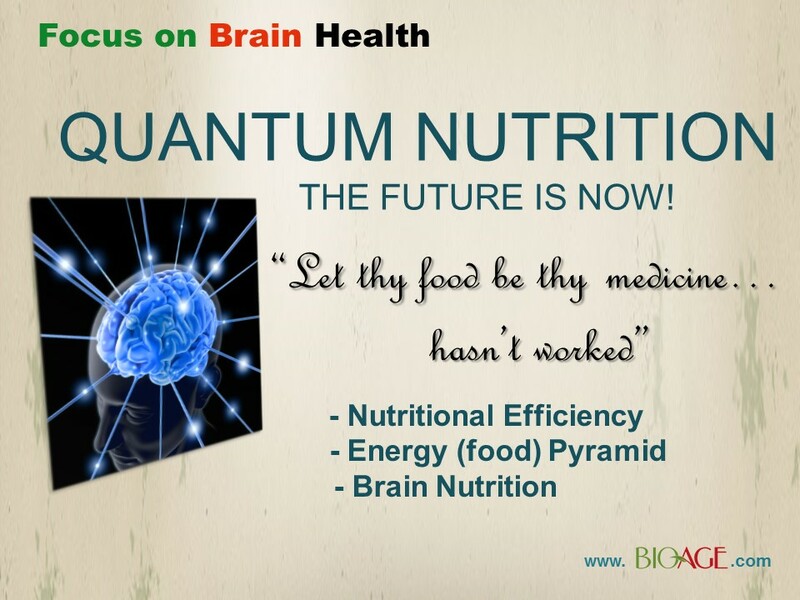 We will focus on brain nutrition efficiency resulting in regained brain health. Certainly this chart speaks for itself. This Ontario population demographic is quite representative of large population areas in Canada and the USA. You better get ready to deal with brain disease, dementia, Alzheimer’s, and many more conditions in these aging groups. Our already taxed healthcare system will be overloaded. There will be a great demand for assisted living facilities and assisted home living. 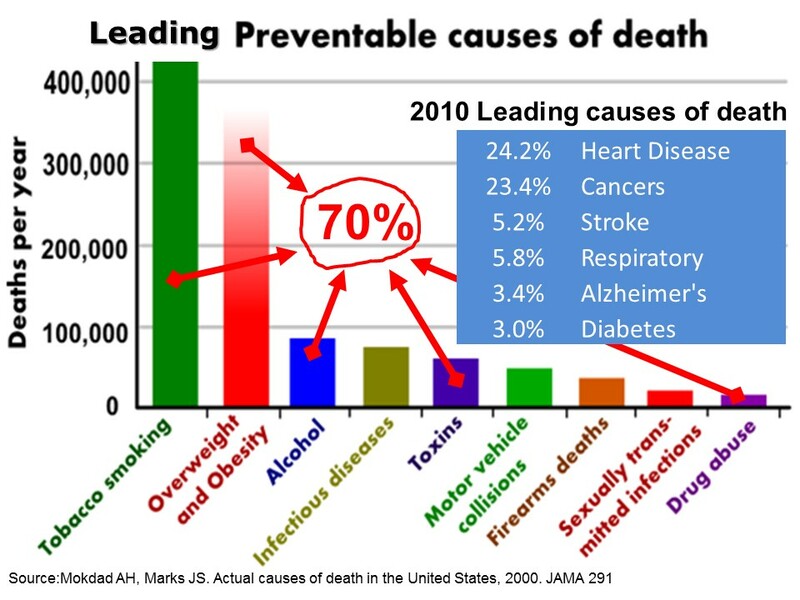 And yet knowing real well the causes of most diseases most practitioners (practitioners of all faith, MD, Naturopath, Chiropractor, Nutritionist, etc.) tend to propose some medicine to solve the problem. Instead of strongly suggesting to their client to stop overeating sugar, salt, fats, junk, too much food, often a pill or supplement of sort is suggested. At this point I invite you to watch the following 11 minutes video showing clips of research conducted in the former Soviet Union staring in the 70’s until 1990. This research was sponsored by the Academy of Science and led by young scientist Dr. Michael Kiriac, PhD. I hope that after watching this video, that you are amazed that such research took place at all. In our North American capitalist business model, there is no such thing as serious research to support either food or supplements that are not patentable. Large research project are supported by mostly companies that stand to gain from the findings. In the case of the BAC research, the government supported the project and spent hundreds of millions of rubles in the process. Imagine what could be achieved if the budget allocated to landing on the moon was directed towards natural solutions to wellness. As seen in the video, more than 20 species where tested and most were mammals. This is of interest to me and to you as we too are mammals. We can safely assume , if not verify that since the same formulation of BAC impacted positively so many species and mammals, that many of those benefits would also apply to human. In the poultry research described in the video, the farm had become plagued with the Marek cancer, low nutrient in eggs, high newborn mortality rate, and a short egg laying productivity cycle of 14 months. Prior to the introduction of BAC in their diet, these poultry lived 24/7 inside buildings with no direct sunlight and were treated with antibiotics and supplemented daily with vitamins and minerals, including vitamin D. When BAC was introduced, all antibiotics and supplementation including vitamin D were removed, and yet within the first year of the study, the Marek cancer was eradicated and the farm gained an overall 20% in productivity. The chickens produced 50 more eggs per year, had 24-month-long egg laying cycles instead of 14 months, had larger eggs and stronger shells with more calcium, and their eggs were richer in protein, good fats and taste. This research demonstrated that when consuming BAC, the animal’s ability to synthesize the hormone (vitamin) D was stronger even with minimal exposure to light from the small side windows. Understanding this example explains why consuming BAC tends to awaken all metabolisms governed by the Hypothalamus-Pituitary Axis of the brain. I chose to present this information about the metabolism of vitamin D because of its current “hot status” and popularity. 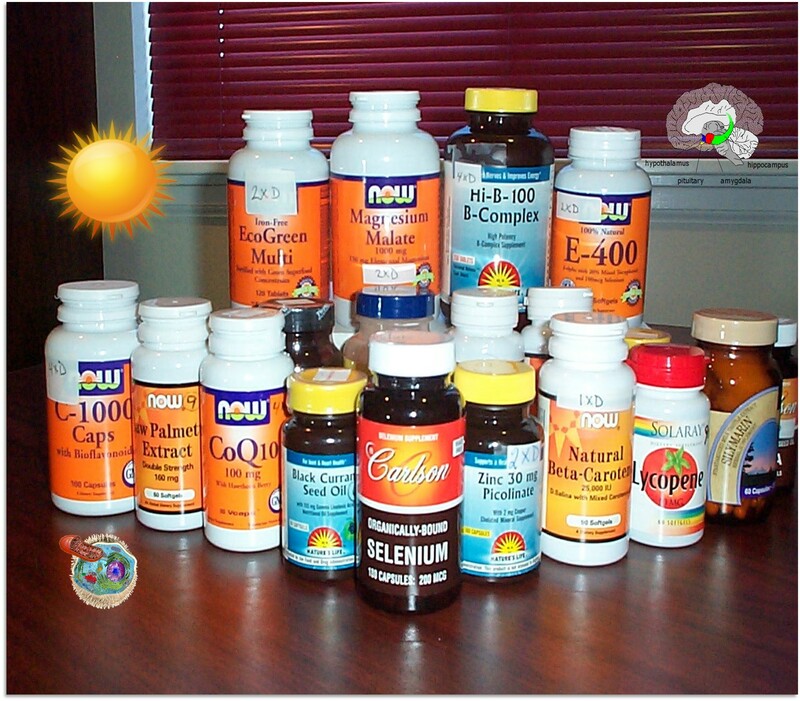 I remember just five years ago when no one talked about vitamin D. Now it’s all the rage. It somewhat reminds me of when vitamin E exploded on the market in the early 80s. I started taking it myself when my physician recommended it for its anti-cancer, anti-arthritic and cardiovascular benefits. Interestingly, to this day there is no empirical evidence to the claim, and still millions of people take the recommended 400IU gel daily. Do you ever stop to think that if you took a supplement for each of your deficiencies and symptoms, and one for the prevention of each future symptom and disease, that you would have to take dozens and dozens of supplements and drugs? Can you see something wrong with this picture? Yet millions of people do just that. In my practice, I recommend applying the basic wellness principles before entertaining medication or supplementation. Eat mostly plants and not too much (lose the weight), drink mostly water, exercise everyday, rest and relax abundantly, stop eating junk, and in a matter of a few weeks you will start to see the reversal of many deficiencies and symptoms. And of course complement your diet with BAC. Let they food be thy medicine, and let thy medicine be thy food”, in my opinion isn’t working. I am proposing to reword this quote as “Let thy food be thy fuel, and let thy cells be they medicine”, and I will explain how and why next as I describe how we human, or ultimately how each cell in our body must acquire and tap into our food/fuel to generate the energy required for cellular metabolisms within all organs, glands, tissues, muscles, lymph’s, and brain. If we stop for a moment to be romantic nutritionists and physicians, we can see what sciences before us have proven undeniably, that all matter is energy, including the thoughts we think, the air we breathe, the food we eat, and the cells of our body that receives our foods and their nutrients, which in reality are grouped atoms that form molecules. It is in this efficient or not efficient merging (nutrition) of external and internal energy particles that we thrive or not. Next we will review some basic mechanism of this merging (nutrition). It is scientific “real” knowledge, the biology and chemistry that we learned in college and for the most part forgot, or chose to ignore in exchange for communal or social simplicity. In other words, it’s a lot more fun to just eat the “darn” burger then to think about of whether it is a good source of energy or not. Most of you have heard the word photosynthesis and learned in primary school that plants produce energy from the sun. 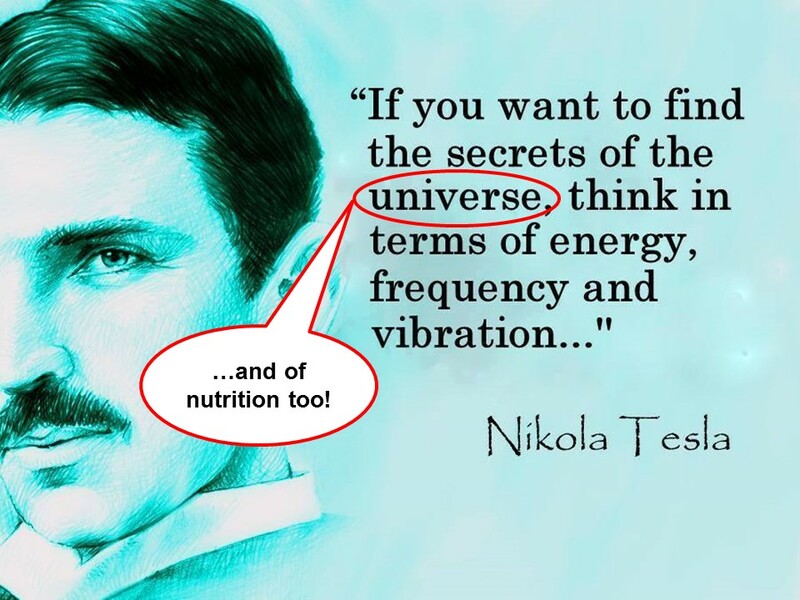 Well it is true, and I hope you realize that it is the MOST important thing that you need to know about food and your energy. Photosynthesis is this energy that elephants derive from feeding on grasses, small plants, bushes, fruits, twigs, tree bark, and roots. It is this energy that gigantic blue whales derive when feeding exclusively on plankton, and very tiny shrimplike crustaceans known as “krill” themselves living off plankton and algae. Photosynthesis is the process by which plants and some single-celled organisms produce sugars from sunlight and carbon dioxide. These sugars then become the food used in cellular respiration. In plants, photosynthesis occurs in specialized structures known as chloroplasts. Photosynthesis is heat as in the fire burning at the core of the earth, as in wood burning, as in the energy generated in the mitochondria of each cell of our body when carbohydrates and fats from plants are transformed into ATP (energy) during the Krebs cycle. I think most of you have seen this simplistic representation of photosynthesis. Its shows that life on our planet comes first from sunlight, and that from this energy plants grow, produce and store energy within its chloroplasts as a sort of fuel. In turn, thousands of mitochondria’s within our trillion cells may derive energy from this fuel. 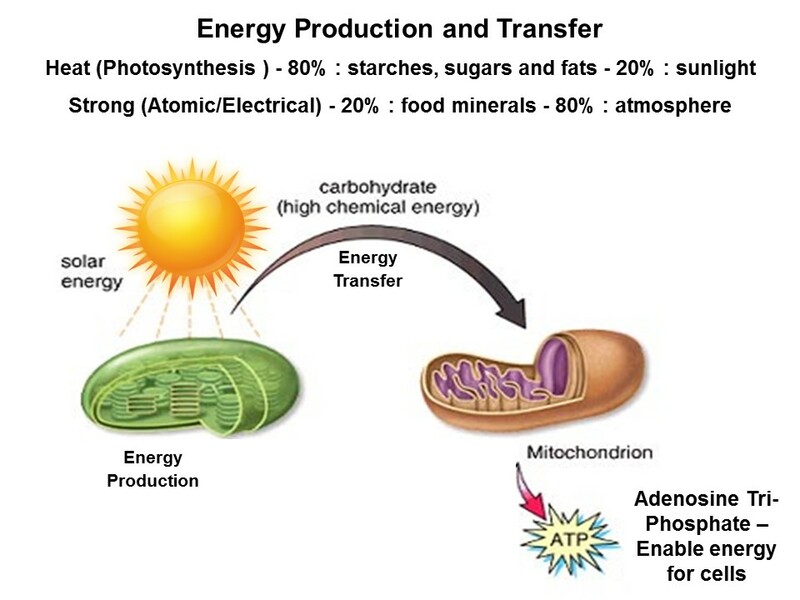 It’s sound pretty simple, but in our body, unlike in our Chevrolet with its 18 feet of fuel line, there are thousands of miles of large and microscopic blood vessels involved in delivering our food/fuel to thousands of mitochondria’s within each of our 100 trillion cells, there to be transformed as ATP or usable energy. Try to imagine that you eat to feed 2000 mitochondria in each of the 100 trillion cells of your body, that is 200,000 trillion engines not just ONE like the Chevrolet. “ We live off the energy that we derive from our food ”. 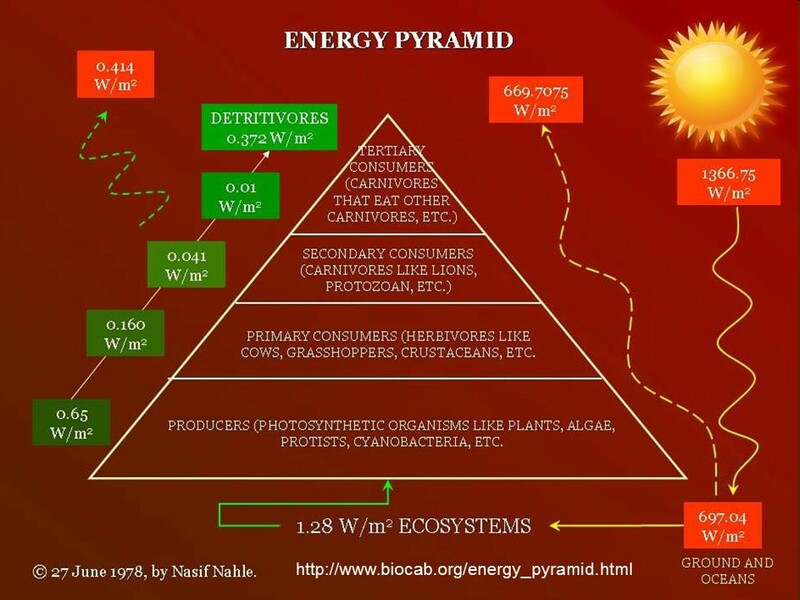 The relationships among energy producers, primary consumers, secondary consumers, and tertiary consumers is usually drawn as a pyramid, known as an energy pyramid, with producers at the bottom and tertiary consumers at the top. You can see from the Energy Pyramid chart above why producers are at the bottom of this pyramid. It takes a lot of producers for higher-trophic-level consumers, like humans, to obtain the energy they need to grow and reproduce. This is the answer to the great mystery as to why there are so many plants on Earth. We will even spell it out for you because it is so important to understand: there are so many plants on Earth because energy flow through ecosystems is inefficient. Only 10% of the energy in one trophic level is ever passed to the next. So, there you have it, choose wisely. Nearly all of the energy that drives ecosystems ultimately comes from the sun. Solar energy, which is an abiotic factor, by the way, enters the ecosystem through the process of photosynthesis. The organisms in an ecosystem that capture the sun’s electromagnetic energy and convert it into chemical energy are called producers. The name is appropriate because producers make the carbon-based molecules, usually carbohydrates, that the rest of the organisms in the ecosystem, including you, consume. Producers include all of the green plants and some bacteria and algae. Every living thing on Earth literally owes its life to the producers. The next time you see a plant, it wouldn’t be a bad idea for you to thank it for its services… which, as you will learn in other units, go way beyond just supplying you with food. After a producer has captured the sun’s energy and used it to grow yummy plant parts, other organisms come along and greedily gobble it up. These primary consumers, as they are called, exclusively feed on producers. If these consumers were human, we would call them vegetarians. Otherwise, they are known as herbivores. Primary consumers only obtain a fraction of the total solar energy (about 10%) captured by the producers they eat. The other 90% is used by the producer for growth, reproduction, and survival, or is lost as heat. You can probably see where this is going. Primary consumers may be eaten by secondary consumers. An example would be birds that eat bugs that eat leaves. Secondary consumers are eaten by tertiary consumers. Cats that eat birds that eat bugs that eat leaves, for instance. At each level, called a trophic level, about 90% of the energy is lost. What a shame. So, if a plant captures 1000 calories of solar energy, a bug that eats the plant will only obtain 100 calories of energy. A chicken that eats the bug will only obtain 10 calories, and a human that eats the chicken will only obtain 1 calorie of the original 1000 calories of solar energy captured by the plant. When you think about this way, it would take 100 1000-calorie plants (those would be enormous plants, by the way) to produce a single 100-calorie piece of free-range chicken. 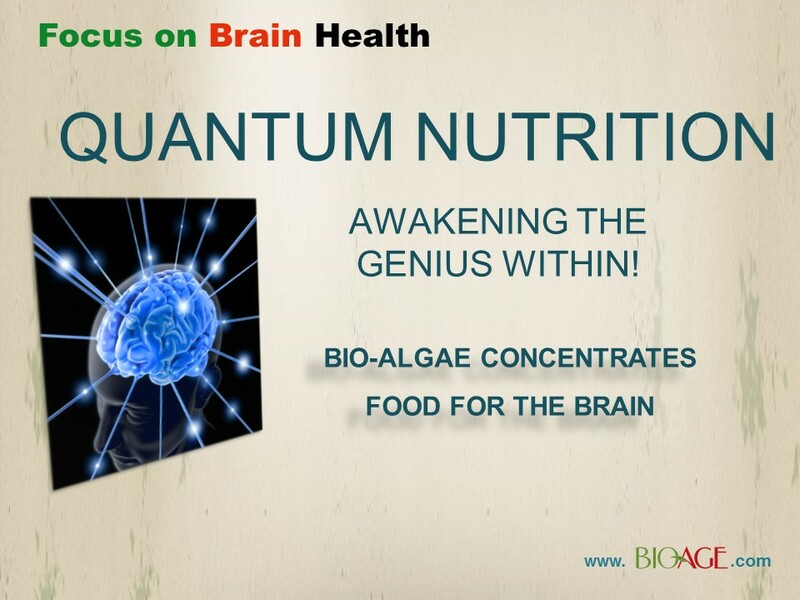 As described in the video, Bio-Algae Concentrates (BAC) are blends of the best known algae on earth. 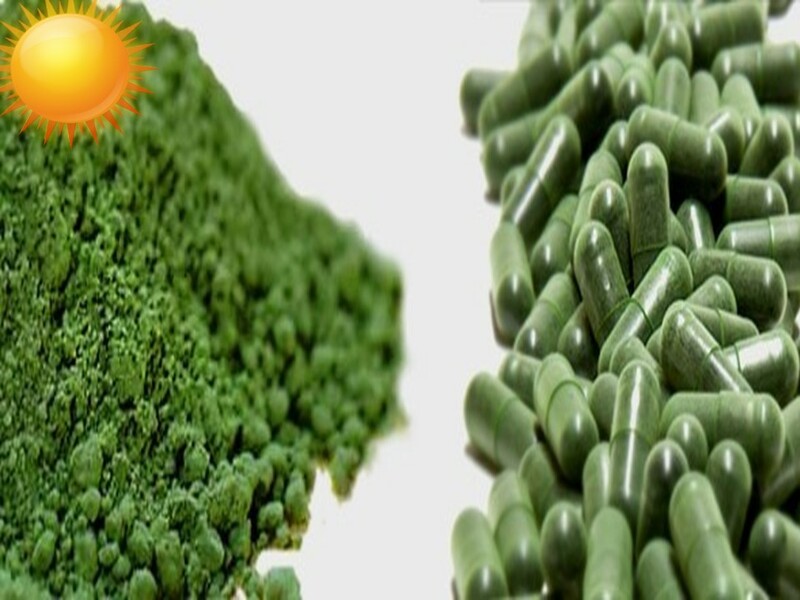 There are two different strain of Spirulina, a Dunaliella Salina and Haematoccocus for its large content in astaxanthin. As such, BAC remains a real wholefood food, a complement to the diet, instead of a supplement! Of the known algae, it is the microscopic “micro” algae, that are the most photosynthetic as far as human nutrition goes. With their extraordinary nutrient density, variety and completeness some are the most nutritious ounce for ounce when compared with any other food on earth. But just as important, due to their specific mix of nutrients, some micro-algae are known to have superior energy transfer potential due to their high content of chlorophylls and antenna pigments. Certain pigments are more efficient than others at supporting the fabrication of energy in the mitochondria. This is due to their antenna-like elongated molecular structure that works in synergy with chlorophylls during the chemical fabrication of energy from our carbohydrates. Chlorophylls – All photosynthetic plants, algae, and cyanobacteria contain chlorophyll “a”. 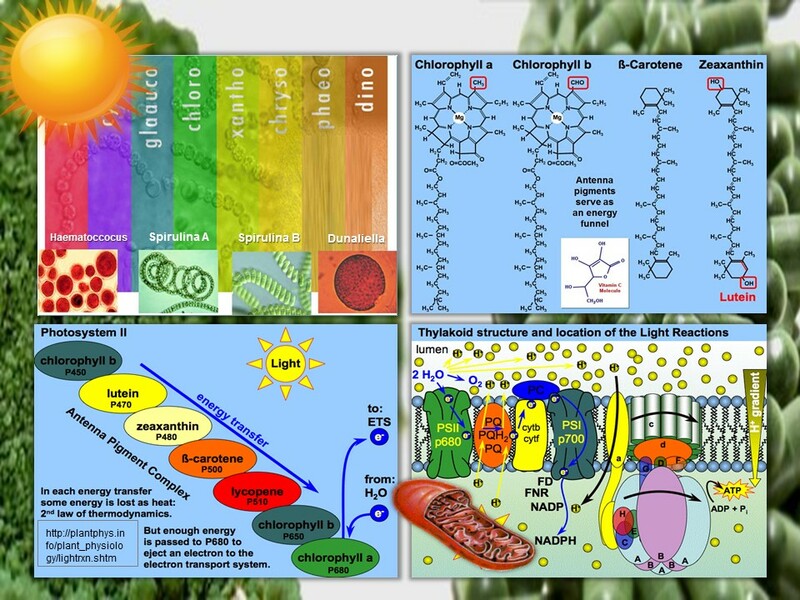 A second kind of chlorophyll is chlorophyll “b”, which occurs only in plants and in “green algae”. Carotenoids are usually red, orange, or yellow pigments, and include carotene, which gives carrots their color. Carotenoids cannot transfer sunlight energy directly to the photosynthetic pathway, but must pass their absorbed energy to chlorophyll. BAC contains dozens of carotenoids along with the required chlorophylls. 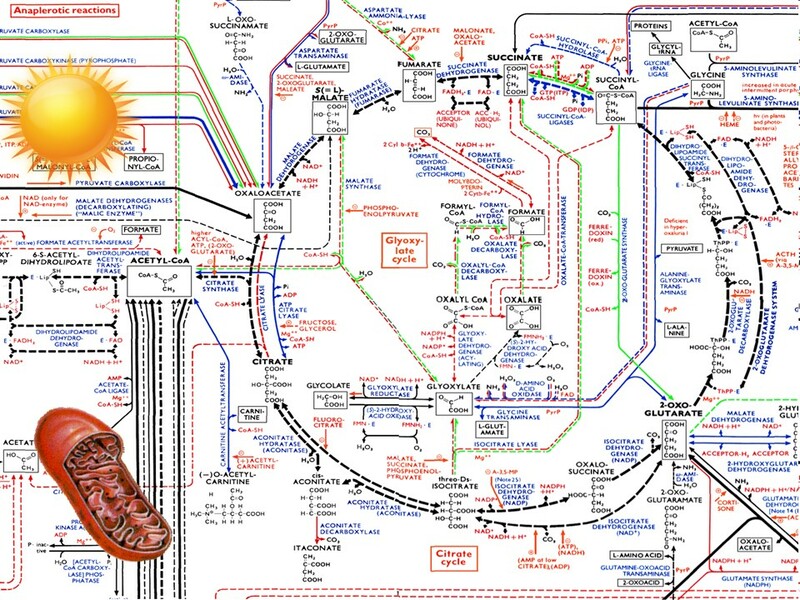 This picture demonstrates the complex chemical metabolism of the Krebs cycle producing ATP energy. This valiant effort by an artist is but a glimpse of the complexity of the biochemical activity taking place in 2000 mitochondria in each of 100 trillion cells of your body. With the details that chemists know today, to truly represent the complexity of the Krebs cycle would take many more charts. And know that we keep on discovering more details with newer microscopes. So folks, remember this picture and the fact that “it’s not about medicine, it’s about energy”, and don’t let anyone compare you to a car ever again. The chemical activity in one mitochondria is thousands of times more complex than that of an entire Chevrolet automobile! Don’t let anybody tell you a grand story that their medicine can reach your mitochondria and fix them, or make them function better. Be smart, and know that the best way to help the wellness of your cells is to bring in high efficiency quality food/fuel. Have no doubt that whole fresh foods, mostly plants are the best fuel for your cells. 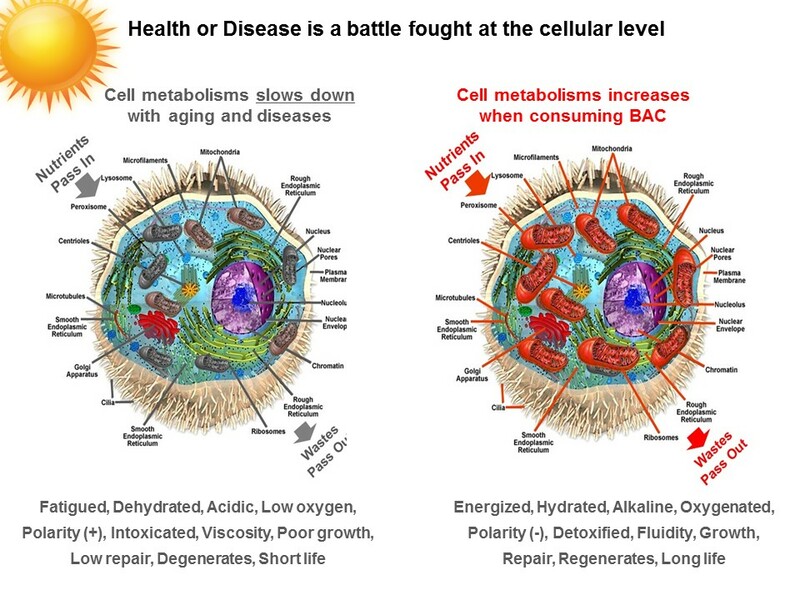 Feeding your cells is how you are able to walk and talk, how your heart continues to beat millions of time per day and how your cells get energy to defend, detoxify, grow, repair and regenerate. Look at this artist’s rendition of a cell, and imagine that it would take a thousand images to barely begin to represent the hundred thousand organelles of your cells. Those organelles are each industries producing millions of enzymes, co-enzymes, proteins, and other bio-chemical factors and co-factors needed by your cells and their environment. It would take hundreds of charts to represent the formidable and most intelligent membrane of the cell with its thousands of receptors and effectors, the homeland security, the central intelligence of your cells. 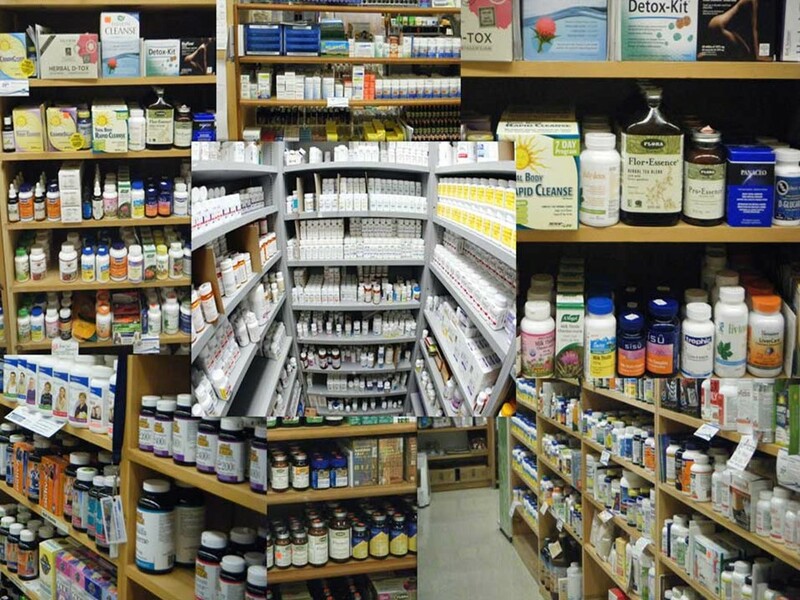 Knowing this, why would you consider taking drugs or supplements, or anything else than whole food? Do you really think that drugs and supplements that did not exist 100 years ago are going to overwrite the 3.5 billion years that it took to make humans the most complex organisms on the planet, and our food the most perfect way to obtain our energy? Doing it the right way is not complicated. If the cell is well fed, then the cell will work hard for you, performing the myriad of tasks that it can do, including cleaning up after itself. Remember or ask yourself “who created you?” From the start when the sperm joined the egg, you were on your own, no doctor, no medicine, just some food and the magic within, right? Do you get this? Can anyone make a skin cell on your body? Please don’t forget this chart and remember that when your cells are well nourished, then magic flows within. That is the medicine within, and no doctor is required for that. The next time you try to imagine that you are feeding ~100 trillion cells each with ~2,000 mitochondria’s, 100 thousand organelles, ~43 millions molecules, and ~100 trillions atoms, that is more atoms then there are stars in our milky way, all this via ~100 miles of arterial pipelines. We have looked at the mechanism that nourishes the cells and concluded that the best way to achieve cellular health is to support photosynthesis via quality whole, fresh and organic foods, mostly plants. In the next section we will look at a more “efficient” act of nutrition, that of nourishing our critically important brain cells, or “Awakening the Genius Within”, which is the name of the book that I wrote about BAC research as it relates to this topic. Near the center of our brain resides a group of “organs” or “glands” making up what is called the hypothalamus-pituitary-gonadal (HPG) axis, but also known as the hypothalamus-pituitary-adrenal (HPA) axis, which I will use going forward. The overarching function of the HPA is the integration of body functions for the maintenance of homeostasis. The multiplicity of functions that are entailed in this level of integration can only be intuitively appreciated. We can says that the HPA is as important as the conductor of a large philharmonic orchestra. And I’ll let you imagine what would happen to the symphony if the conductor became sleepy or sluggish. The HPA and its feedback mechanism is responsible via the central nervous system and a multitude of cascading hormonal triggers for the function of every organs and endocrine glands of the body, and for their synthesis of all hormones, peptides, steroids and ultimately for cellular metabolisms of all cells within the human body. Before leaving this chart I urge you to picture in your mind, that just like the body, the brain is also made up of trillions of cells, including the HPA with its several billions. 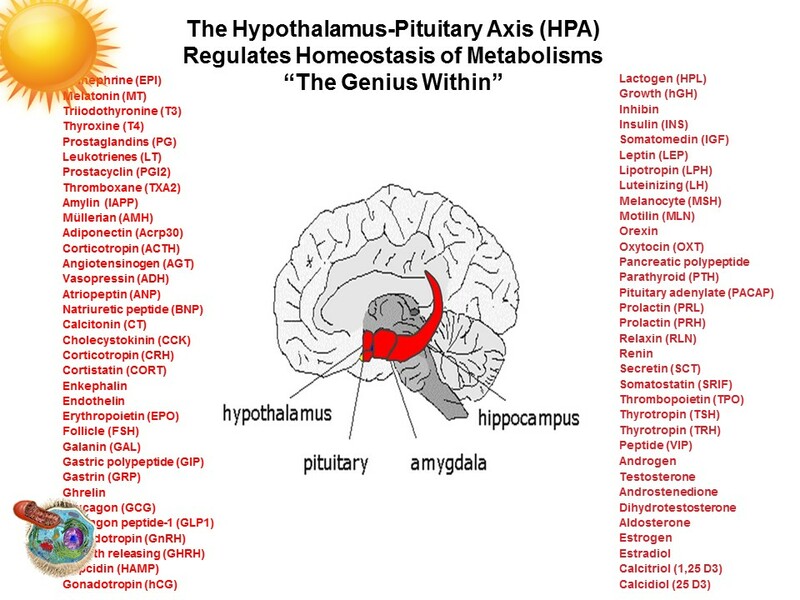 Knowing this, we can have insight as to why the HPA may be coined “the genius within.” Just for a moment try to visualize the cellular coordination that happens within the HPA that allows it to receive/sense thousands of internal and external signals from the body, and in feedback, issue thousands of commands each and every millisecond 24 hours per day, and that for your entire life. Think for a moment that even every word you hear or speak, every odors you sense, every step you make, even every thought you think are immediately perceived, received or initiated at the HPA. Our brain’s HPA control a myriad of vital physiological processes in our body including respiration and digestion but they also allow us to think and feel. Did you know that the speed at which your brain works determines if your body will operate like a well-oiled machine … or on the contrary lets it be shaken by disorder? This disorder may be of the mind; confusion, forgetfulness, depression, dementia …, or of the body: poor digestion, high blood pressure, poor defense against infections, etc. 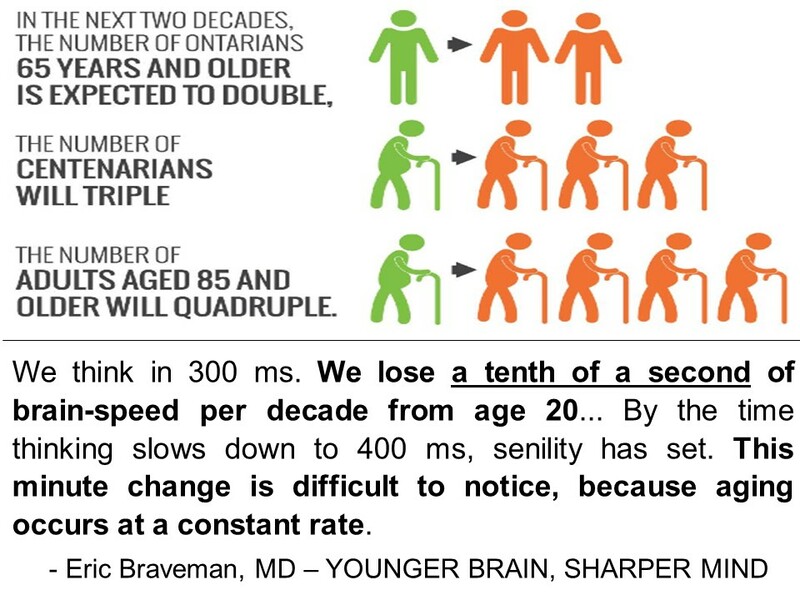 If, during your life, your brain processing speed slows down by more than 100ms; your brain will begin to have serious problems doing its work. In fact, if we take more than 400ms to process a thought or connection, we are no longer consistent physically and/or mentally. 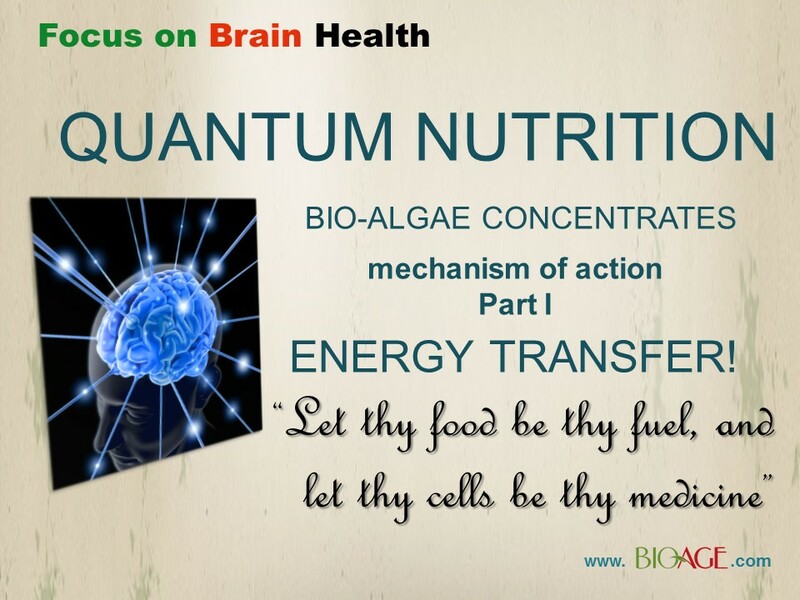 Our brain requires valuable bio-chemicals to become and remain healthy. Our brains not only require good fuel made up of fats like DHA, EPA, GLA, DGLA, sugar, oxygen, important amino acids, minerals, trace minerals, and many other nutrients and phytonutrients, but also require exercise just like our muscles. The speed at which electrical currents travel through your brain also depends on the presence of other complex chemicals known as neurotransmitters like dopamine, acetylcholine, gamma-aminobutyric acid, serotonin and many more. They are called “Neurotransmitters” because they transmit electrical signals from neuron to neuron. And remember that most brain scientists will tell you that we still don’t know much about our brain. But it is now well-known that chronic lack of certain nutrients and neurotransmitters will slow the operating speed of our brain and likely result in serious illnesses. 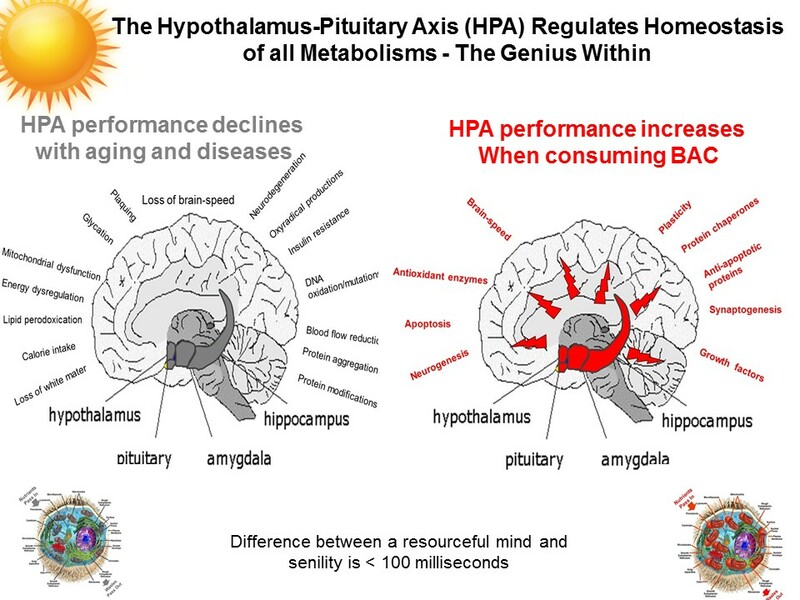 In essence, if we can maintain or increase brain cells energy and resulting brain health, then we will increase HPA health and performance. In turn, glands and organs have no choice but to obey to the increased positive feedback VS the “established” negative feedbacks, and then there is a return to better metabolic gland and organ systemic balance. Energy will flow, blood sugar will be regulated, pH will redress, digestion and assimilation will increase, elimination will be good, placking of arteries of the body and brain will cease, and natural cleansing and detoxification will increase. That is how it works. I know that people take vitamins, minerals, hormones to fill deficiencies, they take immune enhancer, a stem cell enhancer, a digestive enhancer like enzymes, or probiotics, etc. And with this model, there will always be a new supplement for each deficiency or imbalance diagnosed. And for this reason, I recommend to be careful with hormone replacement – with insulin for example – because when these artificial hormones go into the blood, and the HPA reads the adjusted level, it will no longer attempt to correct to proper level – it will stop triggering pancreatic cells to synthesize insulin since you are taking a replacement – and so this lead to negative feedback – and gradually to a lazy pancreas. While when consuming BAC, you are applying a holistic approach, that is systemic to all metabolisms rather then just digestion, or cardiovascular or liver, etc. The current vitamin D craze depicts well my point. Vitamin D deficiency is real in America, as are many other deficiencies and imbalances that come with aging, with poor diet, lack of exercises, stressors, etc. And often, allopathic minded practitioners prescribe supplement for each diagnosed deficiency or imbalance. About 6 years ago, vitamin D became the hottest vitamin on the market as a result of a particular cancer study. Said study did not prove that vitamin D prevented cancer. It simply stated that vitamin D was often low in cases where people had cancer. And since then, millions of people whether they are low or not in vitamin D have started taking the vitamin. Interestingly, most people and practitioners that take or prescribe vitamin D don’t know or don’t care about the fact that vitamin D is not even a vitamin, that it actually is a hormone, nor do they care about why there is deficiency, or not. You see, vitamin D is a metabolism which works with the light from the sun on our exposed skin which synthesises precursor enzymes, and/or with precursor vitamin D nutrients from the diet, and which in both cases are brought via the blood to the liver to be stored there until needed. 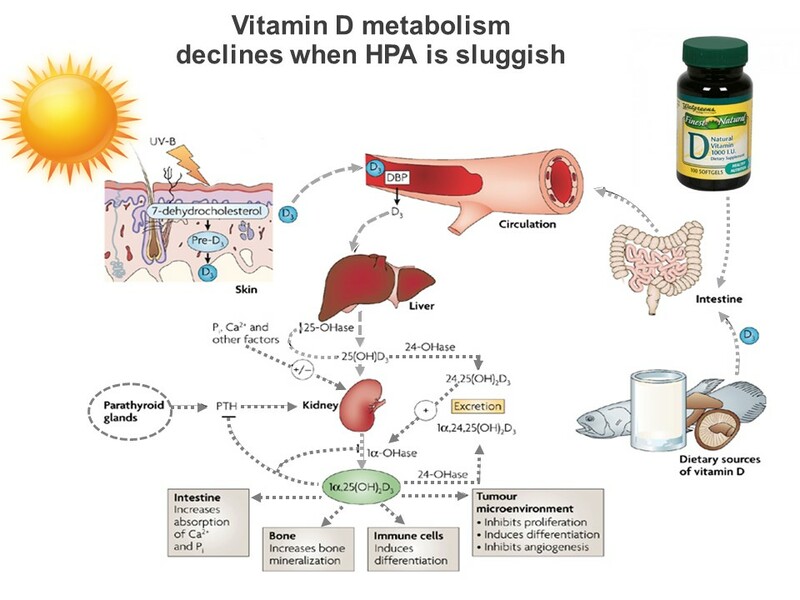 It is the HPA upon detecting the need for activating vitamin D that signals the para-thyroid gland to secrete the PTH hormones which in turn triggers specialized kidney cells to activate the final vitamin D, this from obtaining the precursor vitamin D that is stored in the liver. And with this image, we come to see the light of a different solution, a more holistic, inclusive, global, and systemic approach. I urge you to not give up on your innate powers, on the way it was when you were ten or seventeen years old. Dream, believe that you can return your balance and regenerative metabolism as they should. When consuming BAC, feeding the HPA, the principal conductor of all our metabolism, then you are investing at the smart place in the body. At least give nature a chance before supplementing. Because if you chose to supplement, then there is no end to this patching approach. And every time you chose to supplement instead of addressing the root cause, you are further confusing the HPA. Soon the HPA, feeling unneeded will go on total leave of absence. Yes the research I’ve been talking about took place long ago in a country far, far away. But fortunately, since Dr. Kiriac’s arrival in Canada in 1996, he has been able to validate his research in several cases right here in North America. A placebo-controlled trial was performed at the McGill University Agricultural division with 28,000 poultry being fed BAC in their diet. The results demonstrated the same benefits for the chickens that had been seen in Russia. There are even more projects underway. Let me use this diagram to show you how directly intertwined the relationships of food/fuel are(Photosynthesis) to the cells of our HPA and to the mitochondria within all of our cells. In all mammals tested during the research of BAC, there were many fertility benefits observed: larger litters, more instances of twins, increased survival rate of fetus and newborns, etc. But in the example I am showing you, spermatogenesis is visually evident. The spermatozoid cell itself is shaped for speed, made to race to fertilize the egg, right? We see its tail for navigation, its head for direction, and a body loaded with mitochondria for energy/speed. 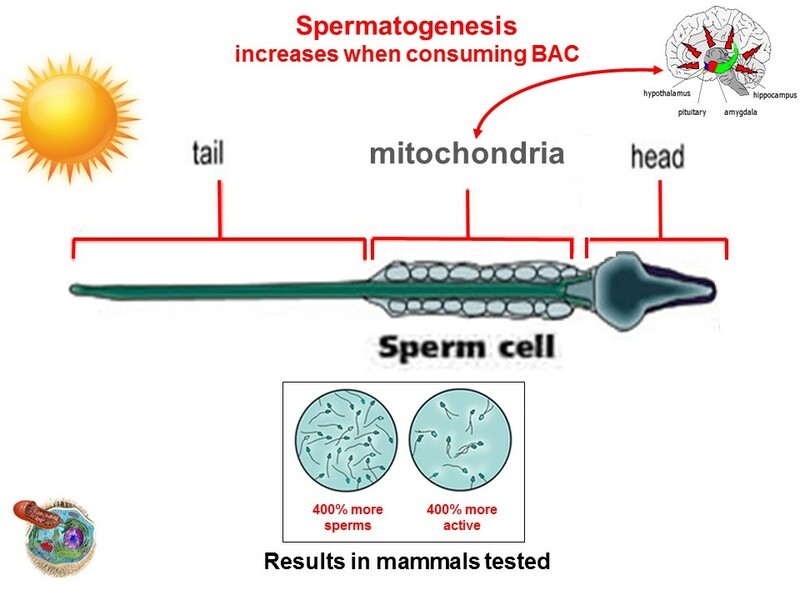 When consuming BAC, all mitochondria of all cells of the body including the spermatozoid cells perform better because of the HPA’s increased performance. During research trials in Russia, all mammals showed a 400% increase in spermatozoid count and motility. 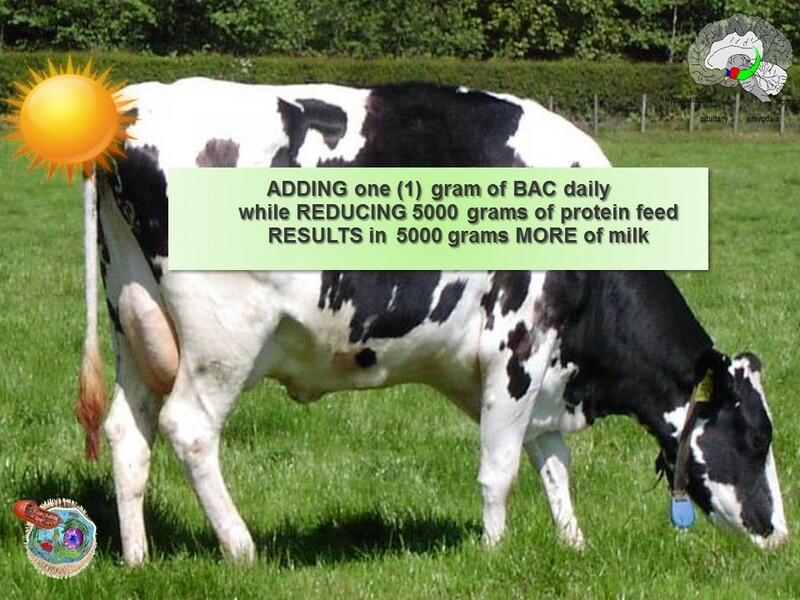 On a daily basis, adding 1 gram of BAC, minus 5,000 grams of protein feed, equals 5,000 additional grams of milk! How could that be? It does not compute right? So clearly the effect of BAC on Awakening the Genius Within is at play here. 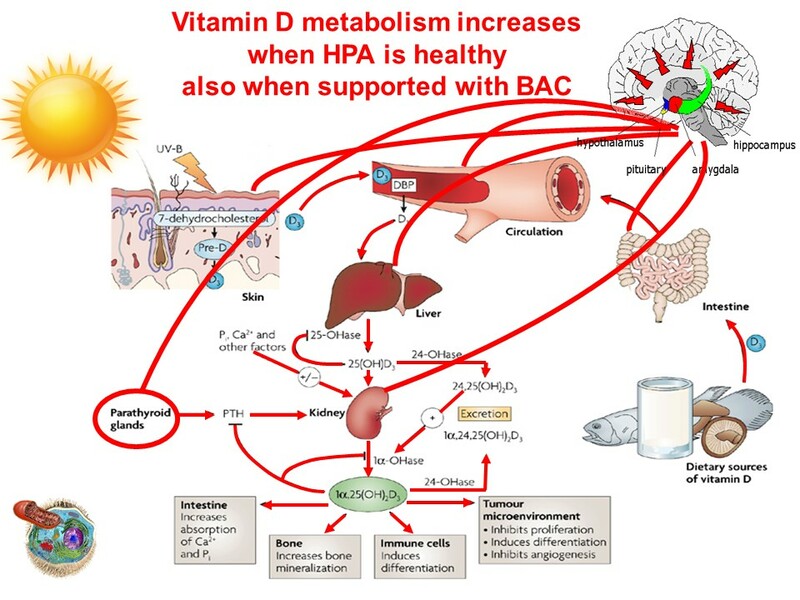 When the HPA of the brain is nutritionally/energetically activated from consuming BAC regularly, then the cow’s ability to assimilate and utilize protein is dramatically increased. Additionally the cow’s innate ability to synthesize proteins at the cellular level is also more performant. The cow’s overall energy is increased and its milk production and quality are increased. The milk volume is increased 20% and protein and fat content are increased 8%. During research in Russia at a large dairy cow farm with over 15,000 cows, extraordinary benefits and performance improvements were observed. 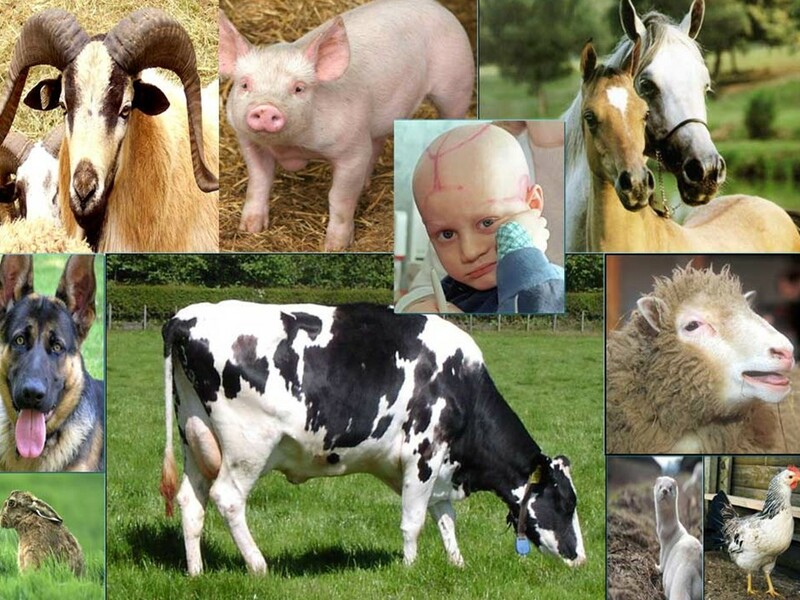 Prevention of cancer was achieved in the first year and severe glandular imbalances in calves were prevented in addition to the elimination of leukemic (reducing somatic cells count) tendency and elimination of mastitis, increase in milk volume, fat and protein content, and reduction of protein feed needed. At the Alain Forget Dairy farm in Montreal, Dr. Kiriac has been supporting ongoing research that is showing the same benefits obtained in Russia. This picture shows some of the surviving Bighorn Sheep that had been affected by Johne’s, an incurable and communicable infectious disease that affects young and newborn Bighorn Sheep because of their immature immune systems. 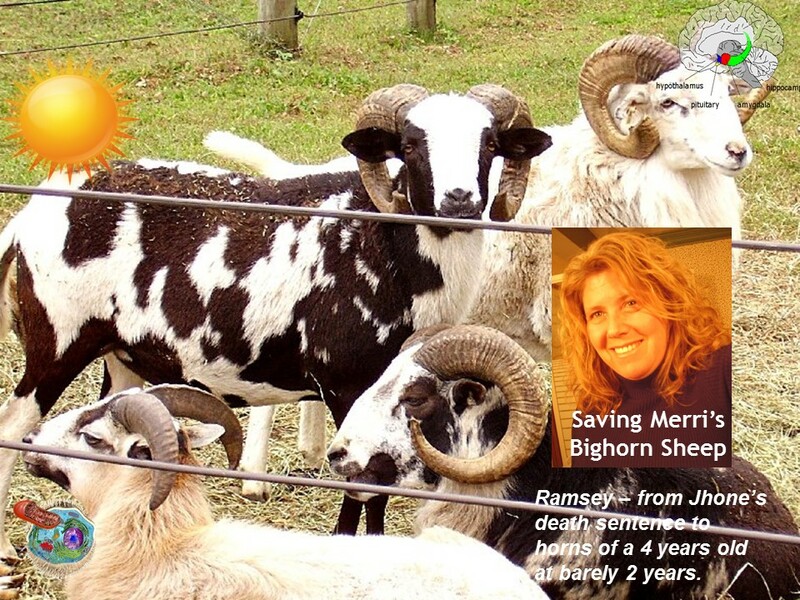 Seven years ago, their owner, Merri, refused to euthanize her herd of 75 sheep as her veterinarian had recommended. Instead, she decided to feed them BAC and within days she started to see the animals get better. In the months and years that followed, Merri documented their survival and progress. Amongst her observations was the larger size of her rams’ horns. Dr. Kiriac explains that protein metabolism is more efficient when the animal is consuming BAC regularly, just like the dairy cow needed less protein feed, the sheep’s horns were growing larger. 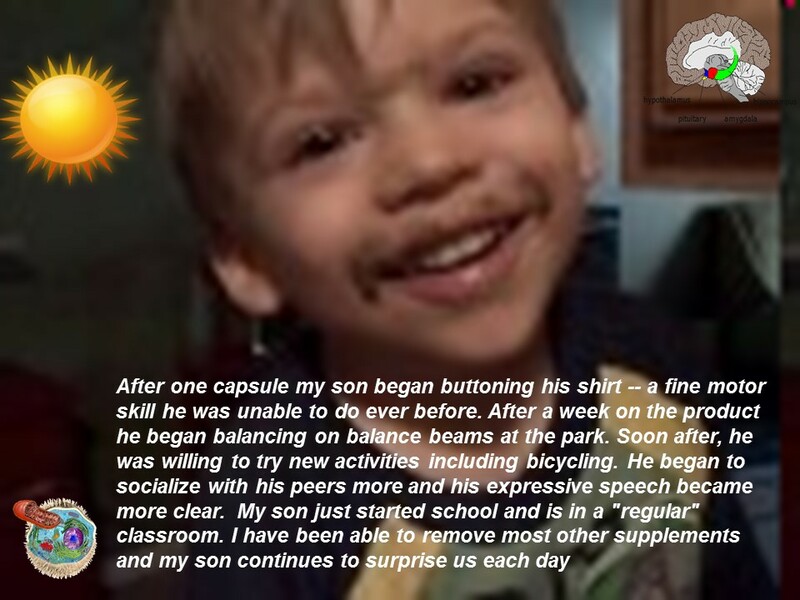 Gina Laverde, the mother of Dougie, a five-year-old autistic boy, met us at a conference in Chicago and purchased some BAC to try with her boy. On the next Sunday she came back with tears of joy to thank us because Dougie had buttoned his shirt on Saturday morning after eating one capsule of BAC the night before. Six years later, Dougie is still consuming BAC daily and loves it, hence the green mustache. I wanted to share this story to help you understand how BAC works very quickly in our body. BAC starts to work as soon as it is broken down by digestion and enters our circulation. And in the case of BAC, digestion takes less then 15 minutes, so the “awakening” effects are noticeable soon after. Does that mean that BAC is a cure, a medicine? No, but BAC is an extraordinary food/fuel that nourishes areas of the body more difficult to reach due to their protected (BBB) location such as the HPA and the retina. I was introduced to Dr. Oster when we met along with his personal aid over a telephone conference. Soon after starting to consume BAC, Dr. Oster, who suffers from ALS, started to notice surges of new energy, muscular and mental strength and endurance. His reports have continued and Dr. Oster is still fighting for the ALS cause as its greatest advocate. As a 15 year survivor of ALS, he is walking proof that with strong will, proper diet, lots of exercise and a few superfoods, one can live much longer and with a better quality of life than even their doctors can predict. In fact, Dr. Oster’s doctors had predicted he would live just a couple of years after his diagnosis. The photo shows changes in the strength of his back muscles, brought about by sheer effort and tenacity doing physical therapy workouts and through committing himself to a proper diet and superfoods. In 1980, after a severe L5 spinal subluxation that would not heal properly even with chiropractic and massage treatments, my doctor suggested I start taking vitamin E, which was supposed to reduce joint pain and arthritis, and prevent cardiovascular diseases and cancers. In desperation and without further research I started taking a 400IU gel of vitamin E daily. During the next 18 years – because of health issues creeping up and my worries of aging – I gradually introduced all of the 23 different supplements that you see in this picture. In the process, I became what I thought was an expert in supplementation through researching their chemical nature, claimed benefits and potential adverse effects. I even recommended some to my family and clients. But the funny thing is that over those 18 years, my health issues were not reduced. On the contrary, most got worse and new ones manifested. I had worsening chronic back pain, a never-healing right knee tendonitis that began following surgery for a teared meniscus cartilage… I gained over 40lbs and suffered from afternoon drowsiness and mild depression about the whole thing. The most depressing thing for me had been to give up practicing the sports and exercises that I used to enjoy like tennis and running. I had dreamed of completing the Montreal marathon before I turned 30. Instead, I could barely sit for over an hour at a time, I could not help my wife move furniture or carry heavy boxes. My future looked bleak even though I was taking all those supplements. Interestingly, during all those years, a part of me had been skeptical about taking supplements, and after I met Dr. Kiriac in 1998, I was able to give myself permission to quit. I was freed from all those supplements. Once he had shared with me his story and research, it became easy for me to appreciate BAC, a wholefood, music to my ears. I had always regretted taking separate/isolate nutrients knowing very well that these nutrients were available in a good diet. I realized now that I had fallen for the marketing and allopathic model of “one supplement for each symptom.” I believed then that supplements being “quasi natural” would be better then pharmaceutical solutions, which I did not want to embark on. By nightfall on the first day that I took the capsules, I knew that BAC was special. I felt a very pleasant surge of physical and mental energy. I continued taking some daily and over the next few days I felt so good about my results that I started to stop taking my old supplements. Within three weeks I had quit all of them. 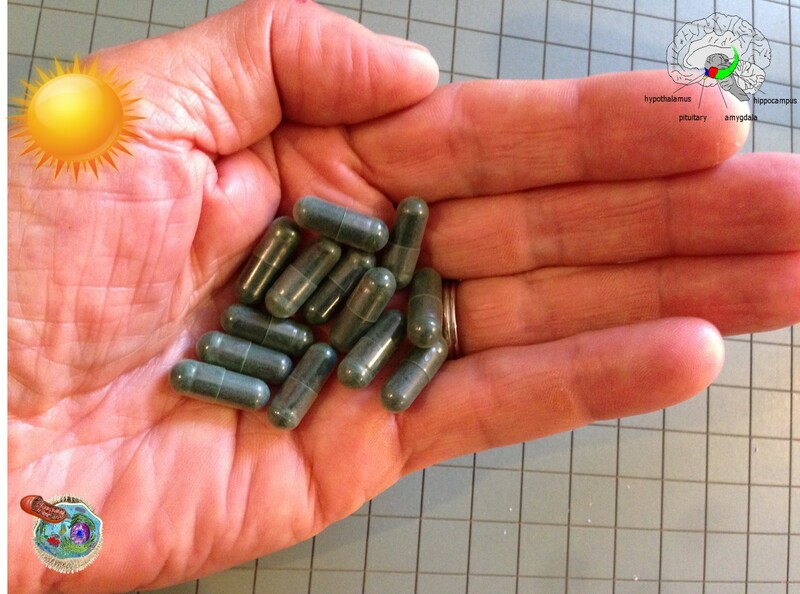 It has been 15 years since I began only consuming a handful of the green BAC pills every day. But here is where my story gets better. Within weeks of consuming BAC daily, I started to feel and see and verify so many changes in my body, my mind and even my spirit. I literally felt like I was soaring into a wonderful future. 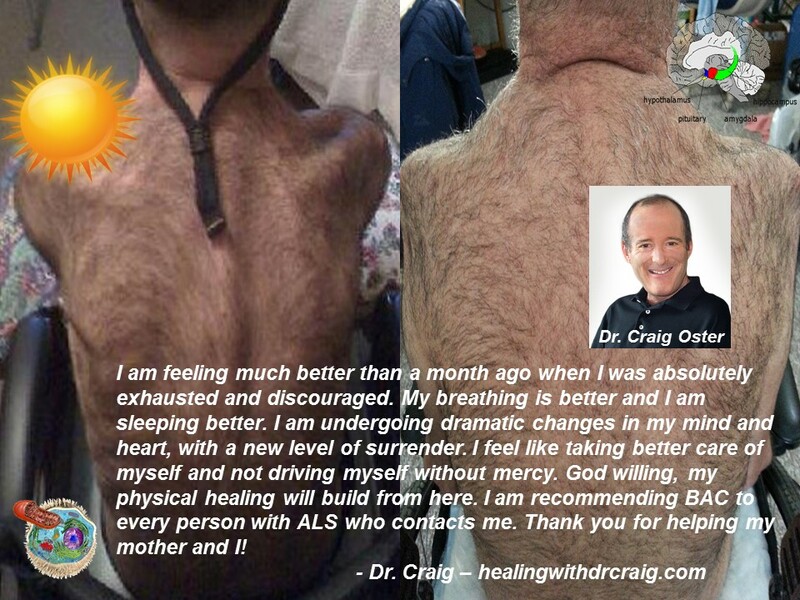 I was able to sit without pain for longer and longer periods, even late into the night working at planning the marketing and distribution of these extraordinary BAC capsules. I saw many changes in my digestion and elimination. My stools and urine went from dark to pale, from thin to large as I started having two to three bowel movements per day instead of the one or less that I was used to. I was less (or at times more) hungry. My enjoyment of food increased as did my color perception and vision. Everything became clearer and brighter. I felt highly charged and motivated to grow and change. I started brisk-walking daily for 50 minutes after reading a book titled “Walk Yourself Thin.” Soon I started jogging and then running, and ran my first half-marathon after six months. Within the next 12 months I ran four official marathons along with the implied thousands of miles of practice in between the races. And the best part was that I did this with more endurance, faster recovery after the long runs, and absolutely no injuries. I have since continued running full and half-marathons, and finally ran the Montreal marathon in September 2012. There were and still are so many other benefits that I noticed then and still do today. My nails and hair grow faster and I heal much faster from small scratches and aches. I saw my right big toenail regrow after 25 years of being declared dead following surgical removal and cauterization. It first became purple then pink and though it is a slow grower, it has remained pinkish to this day. How about not coming down with flus and colds, which often led to painful sinus infections? I used to have a few of those each year and thought, like most. that it was normal. Since 2000, I have only come down with flu symptoms where I had to take a full day of rest and relaxation twice. But two days into each, I came out strong and ready to go. Now I think that is so incredible, as I remember very well how miserable I used to get when I had flu symptoms and sinus pain. There are many more benefits ranging from brain-speed with better focus and capacity to keep on track, better memory and dream recall, stable sexual function and increased physical strength with a higher lactic acid threshold, and much much more. BIO-ALGAE CONCENTRATES (BAC) formulas have received their authorization number from Health Canada (NPN) stating that the three formulations (F1, F2 and F3) comply with regulations on natural products and are “a source of antioxidants for maintaining good health.” BAC contains vitamin A, vitamin B complex including B12, C, E, twenty amino acids, all known minerals and trace elements, thousands of metabolic and digestive enzymes, Omega 3, Omega 6, Omega 9, chlorophyll, phycocyanin and proteins. Moreover, BAC contains an extraordinary amount of antioxidants: lutein, licopene, alpha carotene, beta carotene, and many more. It also contains the mighty astaxanthin, whose natural antioxidant activity is hundreds of time higher than conventional vitamins E and C. The combination of alpha-carotene and beta-carotene in BAC enables optimum protection for the skin, serving to prepare and prolong the tanning process and protect the body from the harmful effects of free radicals that are responsible for premature aging of the skin. 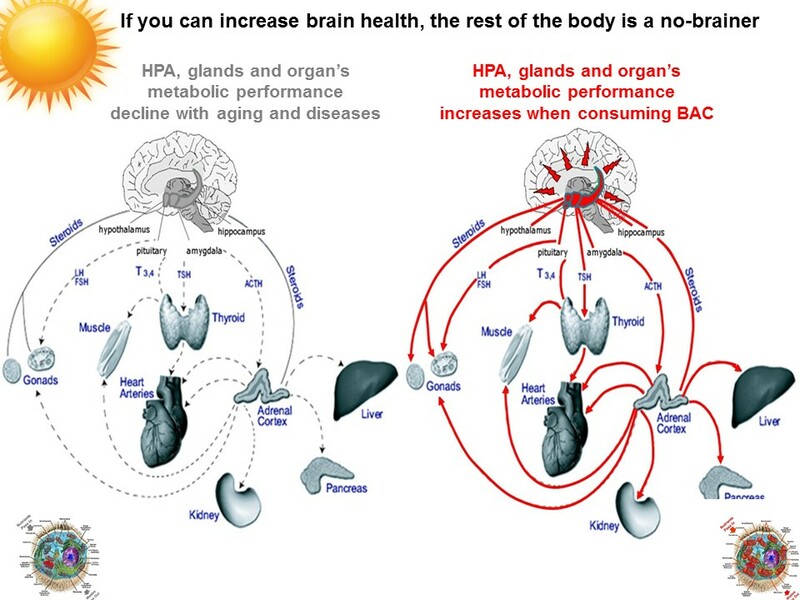 Besides supplying an “extraordinary” array of nutrients, the principal value of consuming BAC is its power to “awaken the genius within.” When fed efficiently with BAC, the mission critical organs of the brain that regulate all metabolic activities will operate better and you will assimilate “vastly more” nutrients from your regular foods, whatever those foods may be. That is the most important added value of consuming BAC, a concept documented in The Magic is BAC at themagicisbac.com. Just like the many people consuming BAC report that they no longer get the flu or cold, many are also realizing how nice their skin looks and that they are not getting sunburns. In short, do not forget to load up on BAC, spend a beautiful fall and avoid the nasty winter flu and the dreaded blues.